Do you have any recent sauerkraut left-overs and don’t know what to do with them? Use it to make a maccheroni salsa. 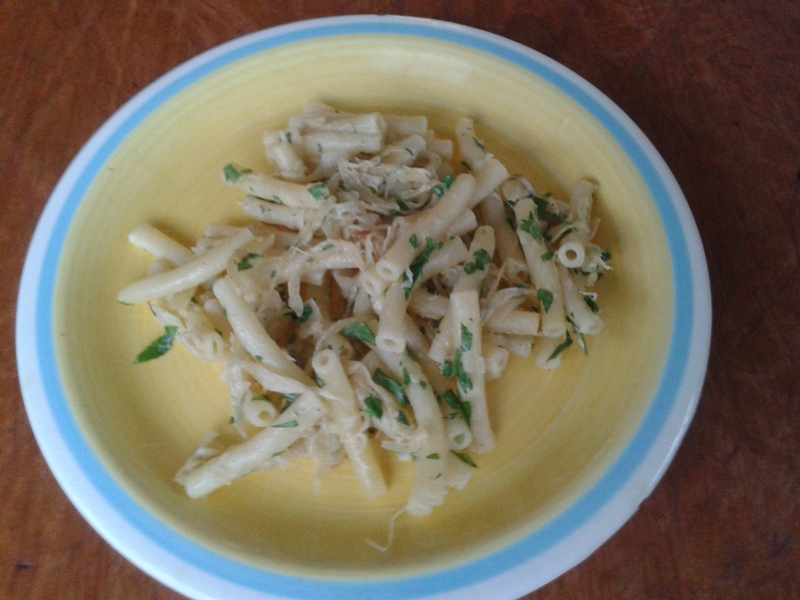 Quite easy: per 1.5 of dry maccheroni take 1 onion and 0.5 to 1 cup sauerkraut. Cut the onion in very small pieces and fry them in a olive oil untill they start getting brown. Add the sauerkraut and turn down to medium heat. Wait till the sauerkraut gets a little bit brown to (or wait 4 minutes). Now add 2 cups cashew milk (or very thick soy cream if you want to – in the original non-vegan version cream was used instead in which half a chicken-soup-broth square was dissolved). Let it cook for 3 minutes and add spices (salt, black pepper, 1 tea spoon caraway seeds, optional 0.5 tea spoon nutritional yeast if you want to, also optional 4 cut leaves fresh sage that you need to fry in magarine first). Sauce is ready. Now cook the maccheroni. Once they are ready add them to the sauce and turn. Finally, add fesh parsley cut into small pieces. Voilá! Where is this recipe from? I don’t know, but there are several versions of it on the net. Supposedly, it is originally from Southern Germany. Normally, it is prepared with ham (added in the end) but I just prefer the ham-free version… Enjoy! Next PostTake a SWIG out of this flask!